Paul, as acting president for the evening, greeted 23 members and 6 guests, including Tracy and Jane all the way from Kenya Africa. Tracy and Jane were both guest speakers at the district conference held last weekend which was hailed as the best conference that many of our members had ever attended, with an amazing line-up of women speakers who demonstrated their fortitude and resilience as they fought their way from dire circumstances to the highly productive members of society they are today. 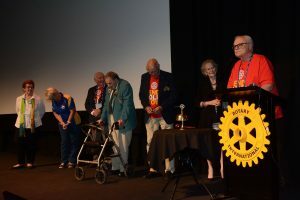 The Rotary Club of Coolamon was well represented at the conference. 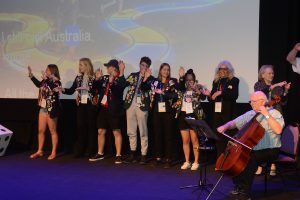 Paul was one ticket off from winning the trip to Nepal, Wayne enjoyed it immensely saying it was well worth the trip to Griffith and back and Bondy did a great job on the cello at the closing of the conference. All members agreed it was a fantastic success and congratulated DG John G for his perseverance and effort in putting the conference together with resounding applause. 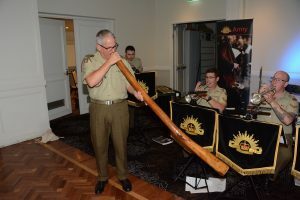 Next year's conference (the last for District 9700) will be held in Temora and the organisation is well underway already. DLIC Jane Mberia speaking on membership growth. The presentation of the Service Above Self Award to PP Paul Murray. This is the highest award given to any Rotarian and only 100-120 are awarded each year by the RI President. On stage with Paul are the other SAS members who have this honour. Maria Egan has the Partner's SAS; the others L-R PP Mary Brell, PDG Fred Loneragan, PDG Bill Donaldson, DG John, PRIVP Anne L. Matthews and PP Paul Murray. Absent PDG Ray King and PP Alok Sharma. The closing ceremony involved John Bond in a flash mob finale! The vote for on the motion to amalgamate future district 9705 with the district north of 9705 was put forward. Paul acted as proxy on Daryl's behalf and after some consideration the motion was denied primarily because the delegates wanted more time to consider the ramifications of the motion to those districts being merged. It was agreed that it was very likely that he merger will go ahead but that members in the district need to be informed about the likely consequences of the merger. Dave and Henk attended the Rotary Youth Driver Awareness program (RYDA) held in Wagga with 18 year 11 students from Coolamon Central School with teacher Josh Celi and community youth coordinator Lewie. The Rotary Club of Coolamon sponsored the students for the cost of attending and the students all took the day very seriously, representing the school and the Coolamon community very well. The RYDA program is a great program for teaching driver awareness to students just embarking on driving on our country roads and is a credit to the Rotary organisers (one of whom is an ex-Coolamon club member, Max Chapman). Josh also gave the club a big thumbs up for their sponsorship of the day and looks forward to closer ties with the club. District Governor John G introduced Jane and Tracy with a trip down memory lane on his youth in Africa and his and the club's connection to Africa, including the connections with the Rotary clubs of Kenya, of which Jane is a leader in her own right and came to the conference as a speaker to share her insights and to accompany Tracy. 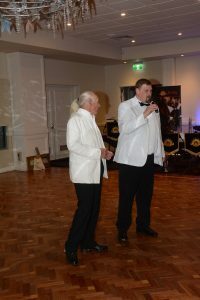 John also spoke of the the mountain climbs that he and Fred made to raise money for Tracy’s sponsorship out of poverty. 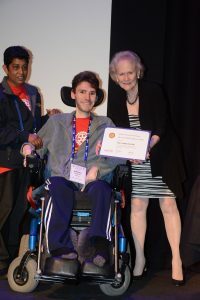 The money raised and Tracy’s own determination have now culminated in Tracy coming to Australia to be a incredibly moving and inspiring guest speaker at the district conference (especially impressive for a 20-year-old). Jane has been a part of the Rotary family for 20 years, the first 10 as a member of Rotaract and then as a member of Rotary in her community. She was treasurer of her club for three years and then president at age 35 before becoming assistant governor of District 9212 and gladly shared her experience and the lessons she has learned with the club. 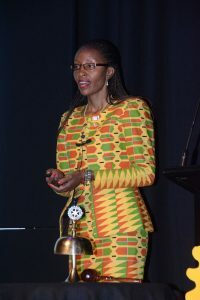 Jane began by illustrating the unique circumstances of Africa, with the continent having a population of 1.3 billion, the majority of whom are in their youth so the population is still growing rapidly. District 9219 spans 4 countries: Kenya, Ethiopia, South Sudan and Eritrea. One of the main challenges in the district has been to decentralize the clubs from major cities such as Nairobi and promote regional clubs. Active efforts in this area have seen memberships double and now the district has 107 clubs in total, 84 of which are in Kenya with an average of 48% female membership with much of the growth occurring by founding new clubs in needy communities. However, despite the growth in clubs, the number of members in the clubs tend to remain static at approximately 30 to 35 members with an average age of 40 years old. Retaining members is still an issue in D9219 just as it is in Australia, and Jane shared some of the lessons she has learned to help in this area. 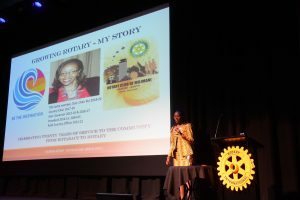 Jane’s mother club was dying when she first shifted from Rotaract to full membership in Rotary, and she said she easily could have joined a more vibrant club, however she chose to stay with her mother club as she believed that it was best to ‘be the change you want to see’; it is clear that her enthusiasm and strong leadership were a major contributing factor to her club now having a strong representation of 42 members. She said that her role first as attendance officer and then particularly president were key learning experiences that helped get the club where it is today. Build a strong leadership team; hold people to account for the jobs they have committed to, and ask them to be honest about their ability to fulfill those commitments. In Jane’s opinion, it is more honorable to move aside when you cannot fulfill an obligation than to string people along. Use committees and subcommittees so everyone in the club has a responsibility and purpose within the membership and work to people's strengths. Build diversity in the club; the wider the variety of people in the club the more skills and experiences can be brought bear. Work on succession planning; try and leave a position stronger than when you started in it. Do as many service projects as you can that help service your community; ask your members about potential projects they can support. Projects that Jane's club has helped sponsor include sanitary packs for girls so they can attend school and bookkeeping classes for girls to help support their families. Build connections with sister clubs all over the world. 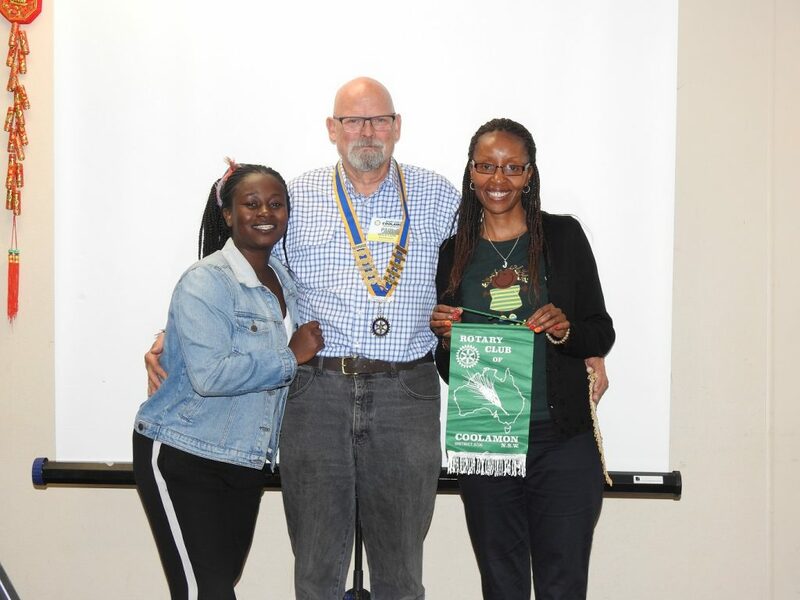 A connection with a sister club in Germany helped her club sponsor a surgeon coming to Kenya to perform 16 much needed open heart surgeries. Give to Rotary; even $2 dollars a day saved from taking a packed lunch to work can have a huge impact. The dollars add up! Don’t underestimate your impact as described in the fable of the little hummingbird; do the best you can, because your best might just inspire others, too. Communicate - never keep quiet about what you are doing. Use every platform you can to tell people what Rotary is doing and encourage others to join Rotary. 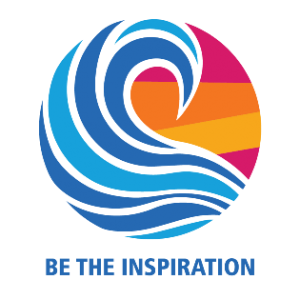 Involve your family; make them a part of the Rotary experience, too. 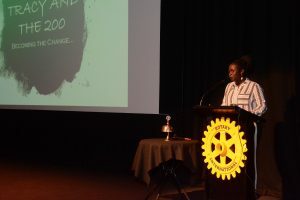 Tracy began by thanking the Rotary Club of Coolamon for sponsoring her, stating that education can really change the world for a child. Tracy then described the circumstances in which she grew up and how her education gave her another option. She came from the Mathare slums in Nairobi where girls are rarely educated beyond the primary years. Young teen girls living in the slums will often fall pregnant to a young guy who is often involved in gangs and in a few short years will typically die in gang-related violence, leaving the girl to raise her children alone, often forced to turn to prostitution to survive and consequently perpetuating the cycle of poverty. The sponsorship by the Coolamon club helped Tracy break out of this cycle, not only for herself but also for her family. Tracy spoke of the hope that her parents had for her going into the future and her hope to help her family escape poverty. 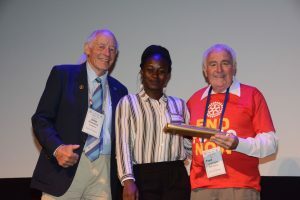 Tracy then described how Rotary has changed her life; she didn’t think she would get to high school, but with Rotary's sponsorship she could see a different path for her life and now she is in one of the best universities in Africa and is studying to be a journalist as she loves telling stories and appreciates the stories of other people. It is safe to say there was not a dry eye in the club after hearing Tracy’s story and I am sure all Coolamon club members are more than happy to have helped in some small way in changing the course of Tracy’s life for the better. The author of last week's Quote of the Week was Charles Darwin. Monday, 8 April - Regular meeting. Coolamon Sport & Rec Club, 6:30 for 7:00 pm. Thursday, 11 April - BINGO. Allawah Community Centre, 6:45-10:00 pm. Paul (captain), Ivan, Leslie, Lyn and/or Anne. Easter Saturday, 20th April - Coolamon Rotary Markets, Pieper Park, Coolamon. Details TBA. Thursday, 9 May - BINGO. Allawah Community Centre, 6:45-10:00 pm. Daryl (captain), Alex, Ian, John N and/or Albert. Sunday, 26th May - District Assembly (incoming officers and directors to attend). Saturday-Wednesday, 1st-5th June - RI CONVENTION, Hamburg. This entry was posted on April 6, 2019 at 1:53 pm. You can follow any responses to this entry through the RSS 2.0 feed. Both comments and pings are currently closed.